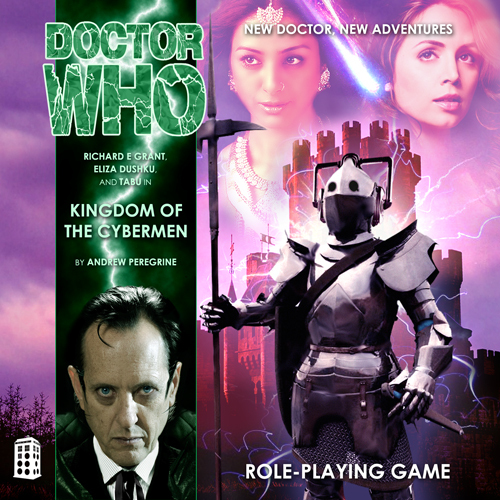 The Dark Dimension Roleplaying with Doctor Who! Continuity: The first adventure featuring the Master and Mohana. Synopsis: Lost in time, separated from the TARDIS, the Doctor and Selene find themselves at the centre of a medieval tournament at Tintagel Castle. The knights who carry the banner of King Mark are legend, among them Sir Kahedin and the valiant Sir Tristan. The strength and bravery of these heroes will not serve them, however, in battle against the soulless black knights who arrive at the castle to issue a grim ultimatum: submit for upgrade or be deleted. The travellers recognize these dark figures as modified Cybermen, but there is more at stake than the cyber conversion of Kingdom Kernow. A temporal paradox of incredible power has been created by these events, and the Doctor and his companion are not the only lost souls to have fallen through time. This entry was posted on 15/10/2014 by hedgewick. It was filed under The Nth Doctor and was tagged with Cybermen, Episodes, Kingdom of the Cybermen, Mohana, Selene, The Master.